The Witch’s Children came into my head after I had been for a walk in Hyde Park, London. Perhaps they were there, who knows? I love Russell Ayto’s witty and vivid illustrations. There’s lots to look at and laugh about. 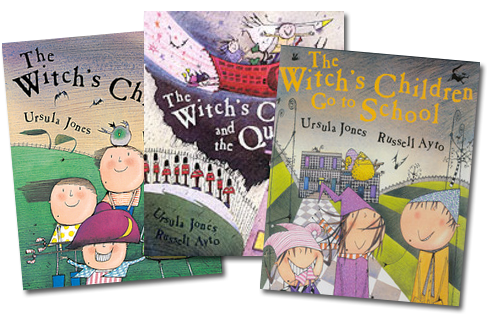 Between them the three books have been awarded The Nestle Children’s Book Prize Gold Award, the 2008 inaugural Roald Dahl Funny Prize and been short-listed for the Kate Greenaway Medal. 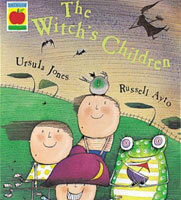 One day in the windy park, the Witch’s three children, the Eldest, the Middle One and the Little One, meet Gemma. Her toy sailing boat is sinking on the pond. What better solution than to change her into a frog so that she can swim out and retrieve it? However, the young witches haven’t learned spell reversal yet so they can’t change her back. And that’s where the trouble starts. 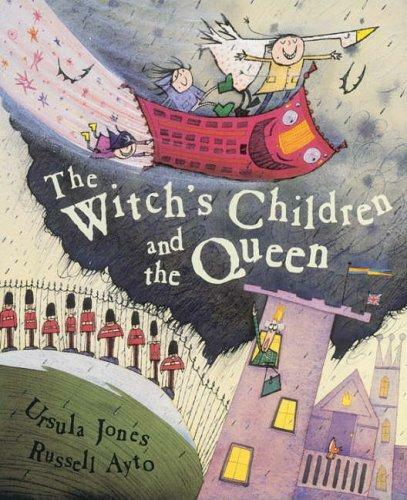 Everyone – from the ice cream lady to the park’s squirrels – is caught up in a chain of witchily logical transformations, as The Witch’s Children try to resolve the situation. But all everybody really wants is to be themselves again. No one is happy, particularly as the Little One finds it all very funny. Fortunately, there is someone who can be summoned to sort out the mess: Mum. And she does. Russell Ayto’s wacky illustrations are a delight. He puts so much fun onto every page. 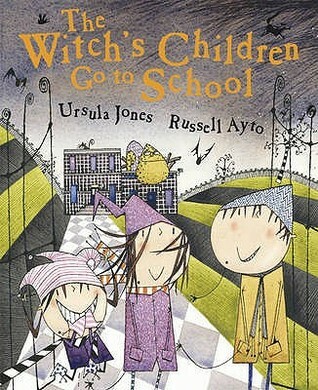 It is Gemma’s first day at school and she is frightened, particularly of scary Class 3. The Witch’s children stroll by and, as usual, try to help. They turn her into an ogre. But now everyone is scared of her. Mum comes to the rescue, but not before the whole school has been turned into a fairytale book and the Inspector of Schools into a big cheese: a very smelly one. This anything-can-happen tale is told with witty text and illustrations and has a satisfyingly reassuring outcome. An exuberant fantasy……executed with wonderful humour and penmanship. If you want to summon a witch, you cross your eyes, flash your knickers and she’ll appear, saying, “ How many times have I told you not to do that? Quirky and funny-let us hope the Queen is amused too (and flattered). The chaos and satisfactory resolution are perfectly played out. An anarchic and colourful riot.